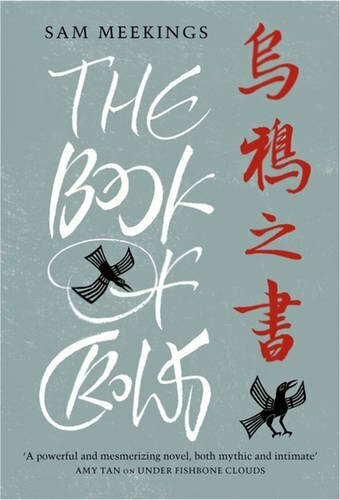 I fear I may have put a few people off this book with my comparison to Cloud Atlas, however I enjoyed Sam Meekings' The Book of Crows much more. Whilst both books have multiple stories spanning across history, Cloud Atlas is a literary matryoshka doll and The Book of Crows is more fluid. I personally like to get drawn into a story, so sometimes struggle when a book contains several plots that jump around. Whilst not a straight-forward time-slip novel, there was enough in my mind to connect the stories together and keep me going. The book in question is a myth that Meekings has created, woven out of the many superstitions surrounding crows, death and prophecy and crows are a common occurrence throughout all the stories. The book is said to contain the entire world, the history, the present and the future and those seeking power also seek the book. The fact that the stories contained in the novel span from 80 BC to 1993 gives the idea that this could be a section of the mythological book. Meekings has a background as a poet and this really shines through in his writing. Each page could be read an appreciated outside of the novel. In the story Rain at Night, the narrator is a poet writing letters to a friend and includes a deconstruction of a poem which I thought was a nice touch. All the stories are set in China and they start with Jade's story, a girl who is stolen by bandits and sold into prostitution. At times, brothel life is horrific, but Jade does her best to get by each day and treat others kindly. She might come across as a bit naïve but the young voice is suitable for her story, she is only a child and has had little experience of the world before her capture. I'm not sure if the narrator of the modern (1993) story is named. A colleague has gone missing after a landslide and the narrator is convinced something fishy is going on. He's abrupt and cynical and I only think he becomes a more sympathetic character nearer the end when more is revealed about his life outside of his marital home. I must admit, the story of the Franciscan monks, travelling across China in 1288, nearly made me put the book down but I did want to know what would happen with the previous two narrators. The monks have a high and mighty attitude and it angered me how anyone not Christian was beneath them. Yes, this is most likely historically accurate, but as they were intruders in a foreign land, they came across as hypocritical. The prose was quite formal in style too which put me off a little. I think it was a fitting punishment that they were falling ill with the mysterious desert sickness. In the end, the message of the book is to live life in the now and not to waste your life away chasing things that don't exist or are impossible to attain. I think I'd read another of Sam Meekings' books providing the structure was more traditional as I did enjoy his writing style in the main.